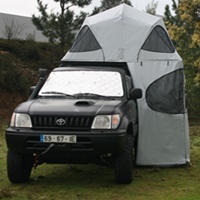 The Vision tent has set the bar for innovation and evolution as the first folding rooftop tent in the world with assisted opening via gas-charged struts. 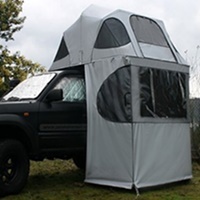 The Horizon Vision is also one of the lightest rooftop tents in the world due to a full aluminum structure, aluminum-composite floor with insulation interior layer, and no need for a noisy rainfly. The fixing rails under the floor allow to place the tent on roof bars or roof rack, and open it in right or left position or back. The design and quality of the materials used makes it a flexible unique tent in the world, with a 5 year warranty. The Vision 180 is considerably larger than the Vision 150 and can accommodate two adults and two children or two adults. Bevelled, anti-slip rubber feet for good adhesion to hard or soft floors. The canvas is coated with six layers of aluminium to reflect the sun's rays, which reduces the temperature inside the tent. The telescopic legs ensure a greater stability and security of the tent. They can be individually adjusted according to the ground. The ladder can be fixed on both sides of the tent, ensuring a quiet entrance into the tent in case of unstable weather. When closing the tent, the shape of the structure helps to tuck in the canvas without any manual intervention. The company "Capaventure Lda" was distinguished by the quality of their performance and risk profile, as a SME leader 2016, by IAPMEI. The Company "Capaventure Lda" was distinguished by the quality of their performance and risk profile, as an 2015 Excellence SME, by IAPMEI. Click here to view the file User Guide. The manufacturer reserves the right to carry out any changes without notice.